Posted February 12, 2018 by Andrew Blair & filed under Features, Headlines, Opinion. The Tenth Doctor, when presented with the chance to revenge himself on a villain via gunshot, said ‘I never would’. The Gunfighters, because nominative determinism. The Seeds of Death, where he built a solar energy weapon and killed an Ice Warrior with it. Day of the Daleks, where he disintegrated an Ogron with a ray-gun. Genesis of the Daleks, where he uses a Dalek gun to destroy a dangerous tape recording. The Talons of Weng Chiang, where he shoots a giant rat with a Chinese fowling piece. The Seeds of Doom, where he brandishes a gun to allow him to escape. The Deadly Assassin, where he tries to stop the President being assassinated by firing a staser. Image of the Fendahl, where he shoots at the Fendahleen with a shotgun full of rock salt. The Invasion of Time, where he kills several Sontarans with the de-mat gun. The Visitation, where he shoots a lock out. Earthshock, where he repeatedly shoots the Cyberleader at point blank range. Arc of Infinity, where he shoots Omega with the Ergon’s matter converter. Resurrection of the Daleks, where he aims a pistol at a Dalek mutant and brandishes a laser at Davros. Planet of Fire, where he kills Kamelion with the Master’s Tissue Compression Eliminator. 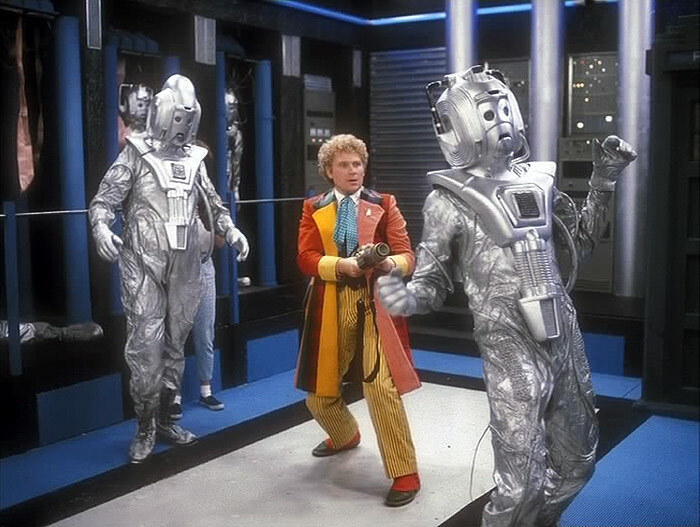 Attack of the Cybermen, where he larks about with guns in the sewer and then shoots more Cybermen later on. 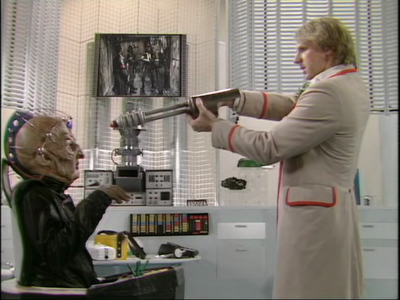 Vengeance on Varos, where he fires at computers, leaves a laser on so people will run into its line of fire. Revelation of the Daleks, where he shoots a Dalek’s eye off with a gun. The TV Movie, where he threatens to shoot himself. Dalek, where he threatens a Dalek with a gun. Bad Wolf, where he threatens the satellite staff with a gun. The End of Time, where he takes up arms against the Time Lords. The Time of Angels, where he shoots a gravity globe. Day of the Moon, where the sonic screwdriver appears to fire energy bolts. A Town Called Mercy, where he aims a revolver at Kahler-Jex. Day of the Doctor, where he uses a gun to carve ‘No More’ into a wall. The Magician’s Apprentice/The Witch’s Familiar, where he aims a Dalek gun at Davros. Hell Bent, where he shoots Ken Bones because Clara died and he’s really rather angry about that. It may come as a shock to precisely nobody that the Doctor is full of it when he claims he never would, although that particular incarnation was largely averse to violence. In theory, the Doctor – ‘never cruel or cowardly’ according to Terrance Dicks – using violence to overcome his opponents is always going to be down to less-than-peak writing. It’s not what he does, after all. However, Robert Holmes – the most celebrated writer of the show’s original run – absolutely bloody loved it. You could argue if you like that this makes him a bad writer, but there’s quite a lot of evidence to the contrary. Then again, in one of the most popular stories of all time the Doctor cunningly overcomes the villain by picking him up and throwing him into a cupboard. The cupboard then explodes, insofar as anything can be said to explode in Doctor Who when it’s being filmed in a studio. This is part of a general pattern of Holmes’ solutions to disposing of villains, but the Doctor being violent is established right from the first story where the First Doctor looks like he’s going to bash someone’s head in with a rock. However, while Hartnell’s Doctor cheerfully wanged people with sticks, spades, lutes (whatever was to hand really), he isn’t seen with a gun very often. As the show becomes more about fighting monsters, we end up with more instances of the Doctor using his genius to kill them. 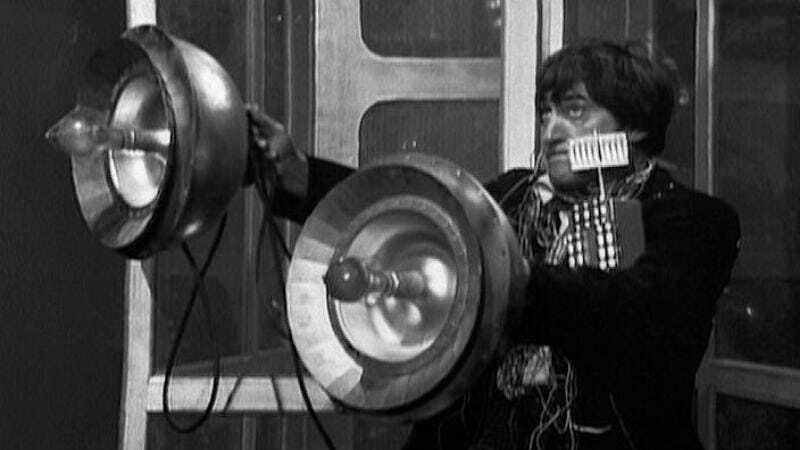 Still, rarely does the Second Doctor actually use something that could be described as a gun. Blood is rarely seen in Doctor Who because of its audience, but lasers are a bloodless way of killing people and monsters ‘must be fought’. Thus, the Doctor can attack Daleks and Cybermen with immunity, as they’ve long been established as evil. From that list, we can see that the Doctor doesn’t always shoot to kill, but another thing becomes apparent. The Fourth and Fifth Doctors use guns the most, with Script Editors for these eras influencing a more violent take on the show. 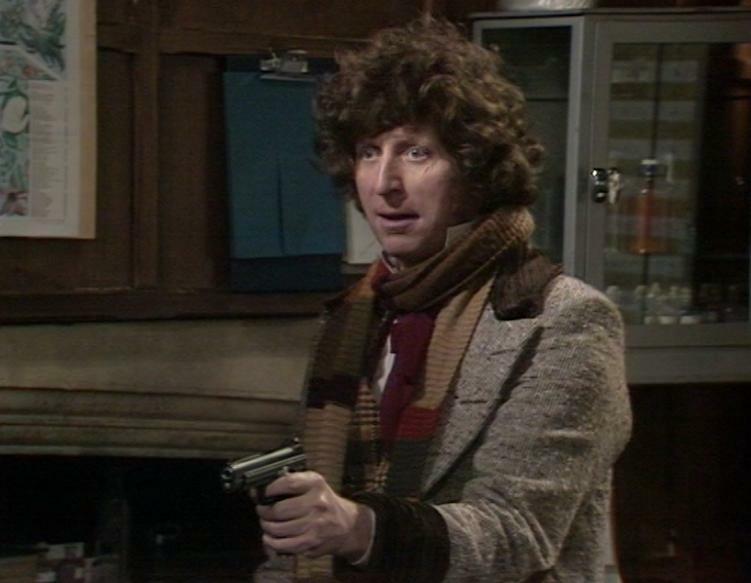 The Fourth Doctor’s use of guns is different to the Fifth. The Fifth Doctor is not as imposing as the Fourth, and this is often given as the reason for the increase in death and violence – he’s not able to dominate situations as easily and so doesn’t lose control as much. It is true that the Fifth Doctor does seem to be put into more desperate circumstances where he’s forced to resort to firearms, but the Fourth Doctor is just as violent without them. Consider how many times the Fourth Doctor simply kills his opponent or dominates them physically: Eldrad, the Master, Magnus Greel, the Graff Vynda K, Solon; farewell to them all. It isn’t true that the Fifth Doctor is more violent than the Fourth, just that he lacks the physicality to kill or attack people without weaponry. That Eric Saward was a huge fan of Robert Holmes, the writer responsible for much of the Fourth Doctor’s violent streak, isn’t surprising. While he wrote some very popular Doctor Who, there is a sense that Saward was attempting to reproduce the style of Holmes, although his stories weren’t as good. Plus, when the more physical Sixth Doctor arrives, the character still blazes away. Since the show returned in 2005, the Doctor is rarely seen with a gun, and greater emphasis is placed on the idea that he gets others to do the dirty work (which does continue from the direction the Seventh Doctor went in), and occasionally seems to revel in it, especially when his wife is involved and the mise en scène is quite pretty. The Doctor is still violent, still capable of murder, but this is acknowledged (the Twelfth Doctor admitting that he’s only “The Doctor” on a good day) and rationed (especially when Russell T. Davies was showrunner) so that such moments are shocking rather than par for the course. The Doctor picking up a gun in Dalek is an important character moment because it’s not expected. When the Tenth Doctor picks up a gun in The End of Time it has so much more impact than if it had been the Fifth. We want, as an audience, to see the Doctor use guns to shoot people with. We’d rather he relied on his wits, even if this does involve tripping a big shouty alien down a ravine using a surprisingly taut scarf.